Ivan Bahia Guide, 'Salvador, 500 years in 1 day' & Pelourinho tour pictures, tourism photography. 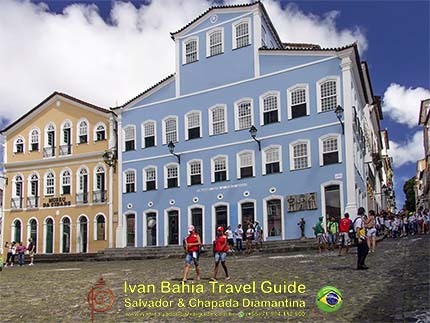 A selection of interesting places you might want select to visit with Ivan Bahia Guide, here in Salvador da Bahia (original Capital of Brazil since 1549). 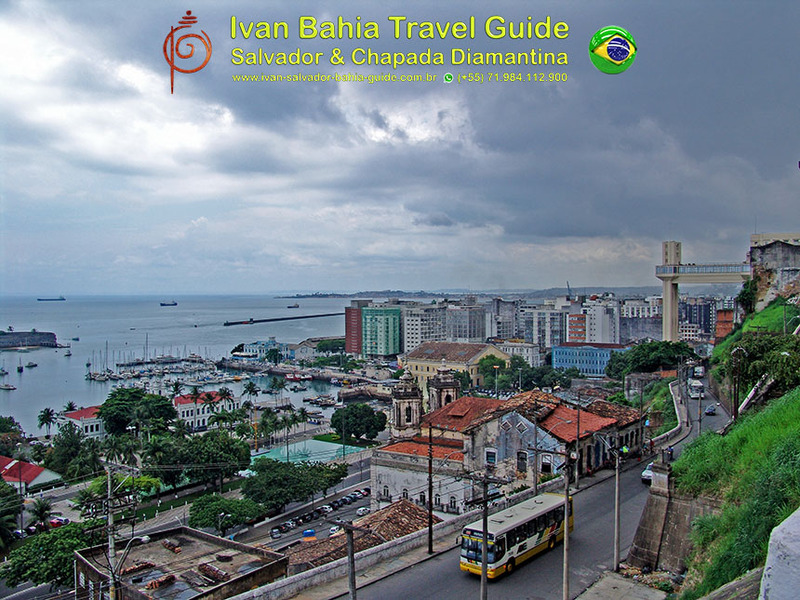 The modern skyline of Salvador in the 21st century Nice areal view of the most modern and chique part of Salvador going from Avenida Sete all along into the Barra area. Jorge Amado's former house in the Pelourinho Housing the "Associação Jorge Amado" nowadays, this (blue) building hasn't lost a bit of it's grace. 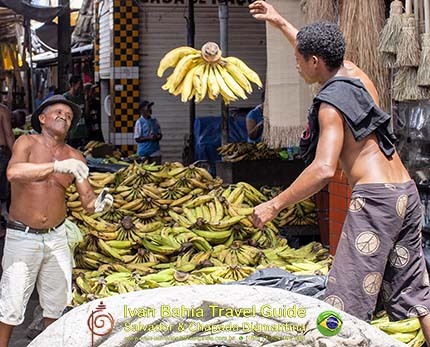 Banana's flying at São Joachim's market São Joachim is a huge market where the common man can almost find everything for his home going from food (fruits, vegetables, meat, fish, dried food, ...) to home-decoration. THE specialist of chili-peppers in Salvador This man, with his shop in the São Joachim market, sell every possible chili-pepper variant available in Bahia. 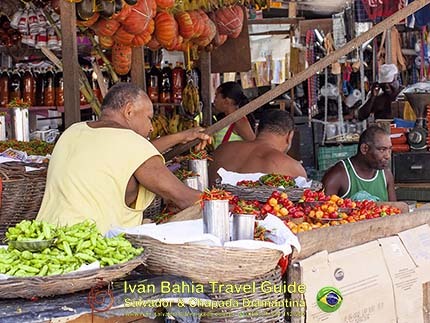 Some of his most popular chilies : pimento de cheiro (also known as "habaneiro", the hottest natural chili in the world), pimento malaqueta, pimento japonès (originally from the Amazon), dedo de moça. Orichás at Dique de TororoOne of the most impressive depictions of the orishá (Cancomblé gods), is located on a big lake and recreation park in the middle of the city called Dique do Tororo, which contains a group of orishá statues dancing in a circle on the surface of the water. 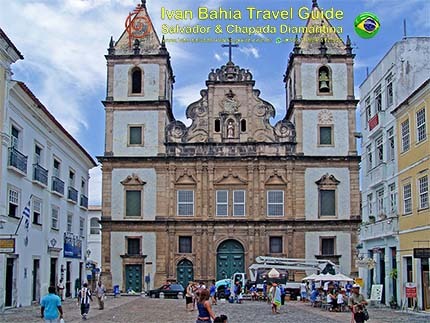 São Francisco Church The São Francisco Church and Convent of Salvador is located in the historical centre of Salvador. The convent and its church are very important colonial monuments in Brazil and also important repository of Baroque art. 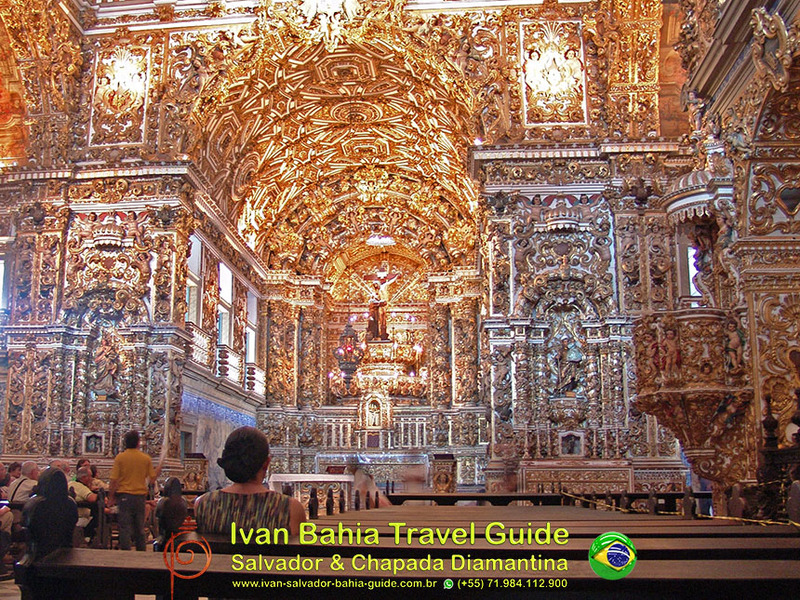 Two tons of gold on the walls ...The most important characteristic of the São Francisco church is its exuberant inner decoration, mostly executed in the first half of the 18th century. 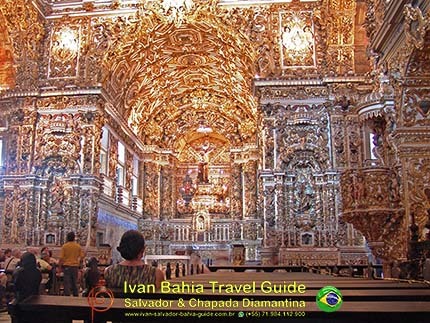 All surfaces inside - walls, pillars, vaults and ceilings - are covered by golden sculptered gilt woodwork and paintings. 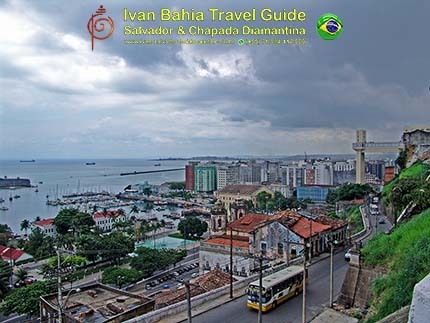 Cidade Baixia aka Comercio The "Comercio' in the lower city part of Salvador is where the commercial activity and banking world started in Brazil in the 17th century. 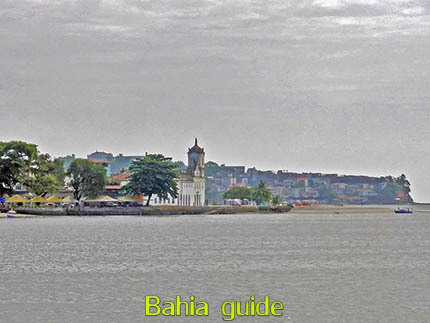 All shiploads transiting from inlands to Europe were negociated, traded and paid in this neigborhood. Nowadays it still plays an imporant role in the city of Salvador. Forte São Marcelo This circular fort was built during the government of Francisco Barreto (1657-1663). 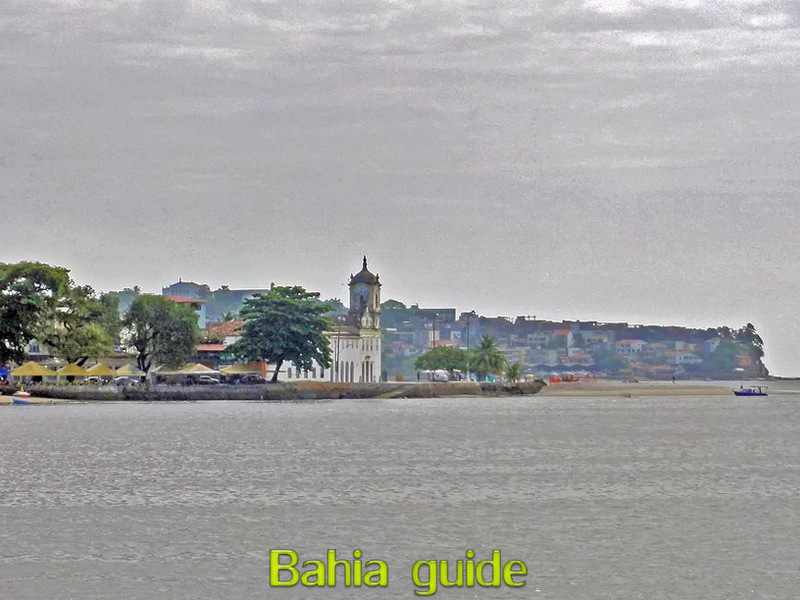 Its objective was to avoid any invasion of the port. In the 1670s it had 9 cannons. 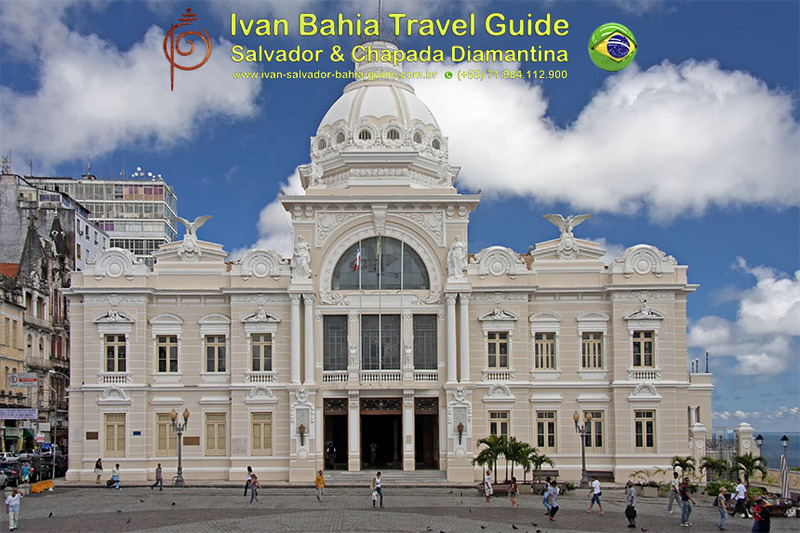 Its slightly circular project is formed by a central turret, surrounded by a ring of equal height, constituting the perimeter and the quarters. It was built in sandstone up to the waterline and the remaining in stonemasonry. The Monte Serrat fortress The Mont Serrat fort, one of the best examples of military primitive architecture in Brazil, gives a panoramic view of the city. 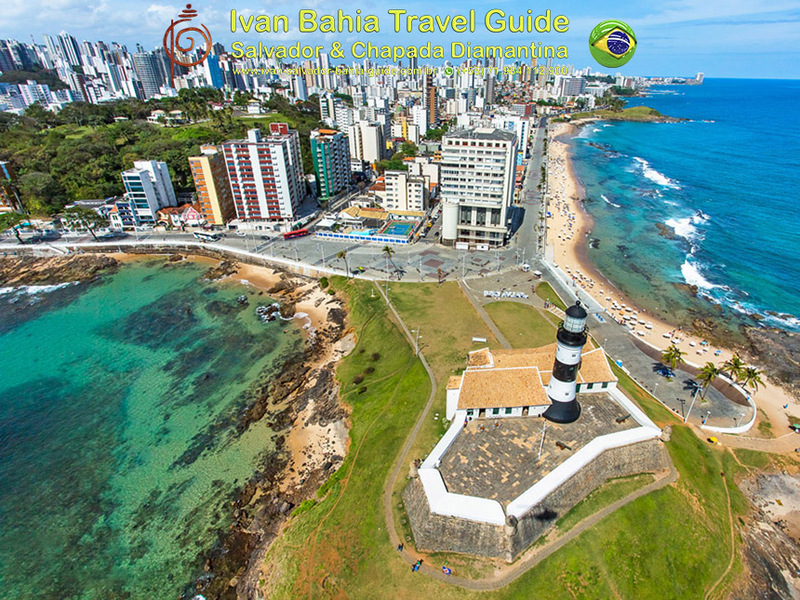 Fortress of Santa Maria Forte Santa Maria is located at Porto da Barra, only 500 metres from the Forte de Santo Antônio da Barra (at the lighthouse). 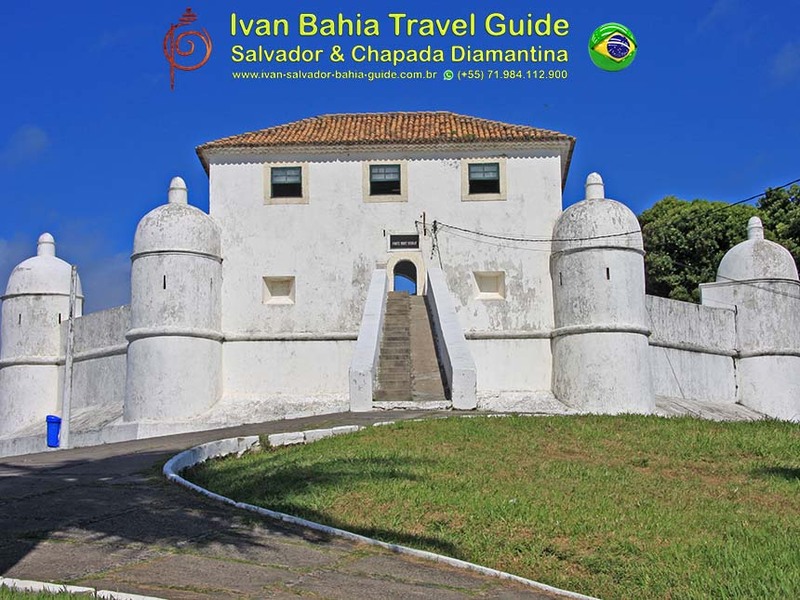 It was built during the government of D. Diogo Luís de Oliveria (1627-1635). 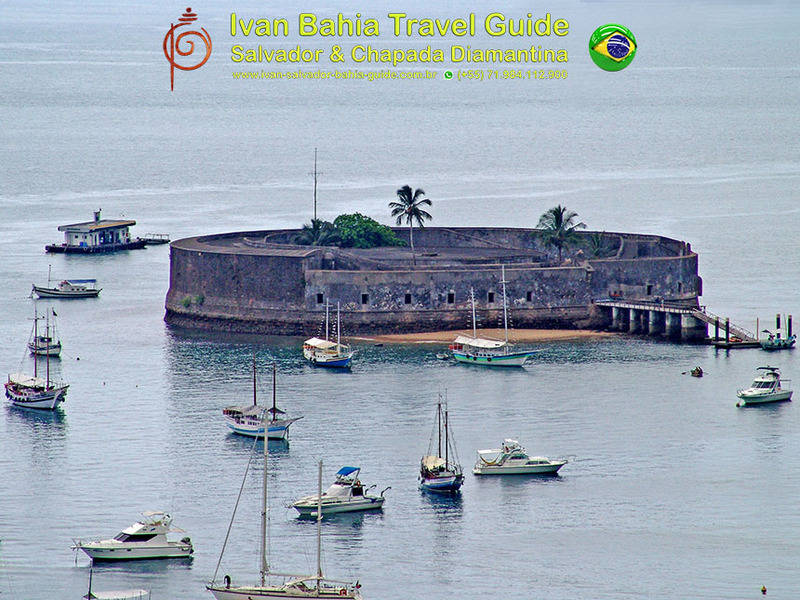 The fort existed during the second Dutch invasion of Salvador in 1638, and was a part of the city defences. 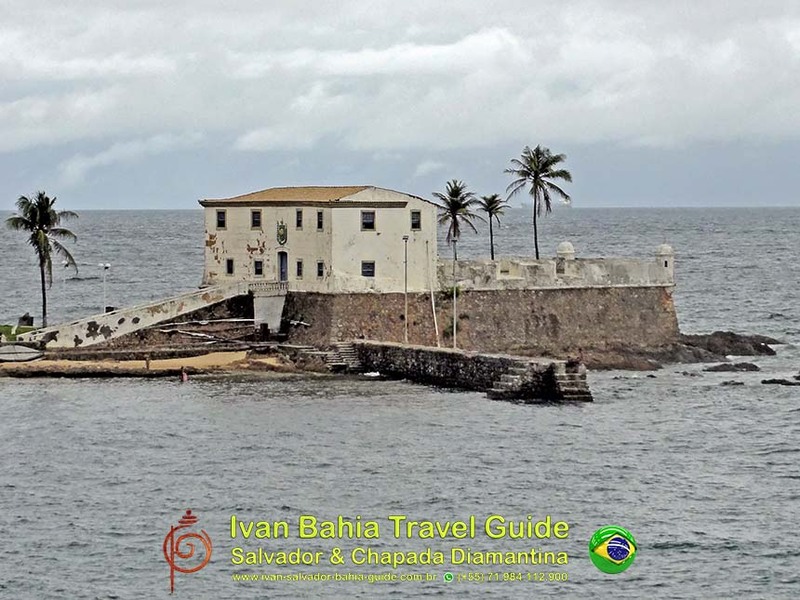 Forte Santa Maria has an Italian style design and was built in stonemasonry. Fisherman under Iemanja's careful watch After some hard labour at sea during the night the fishermen discuss things of daily life under the watchful eye of Iemanja, the godess of water and seas in their typical Candomblé-religion. 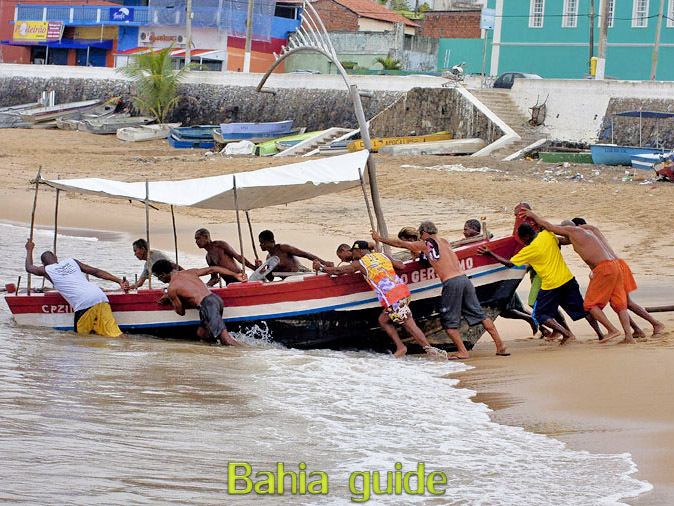 Community life The local community always takes care of it's members and a helpful hand is never far away when there is a need. Cleaning the fish at the spot Fresh fish cleaned as soon as possible is a must to ensure the best quality. 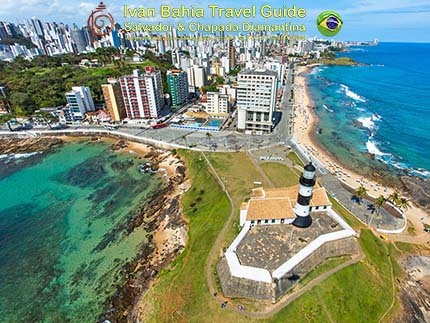 Could you imagine a more charming place to do this job ? Our mobile grocery store Where we live in the old historic city center, we have daily delivery at our doorstep of some carefully selected fruits. Before getting in our neigborhood he has to climb a steep street. 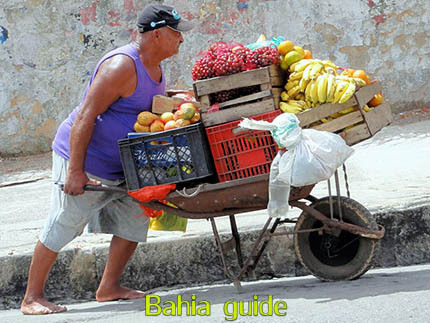 To prevent sliding back with his whole 'shop' this man simply does it barefooted. 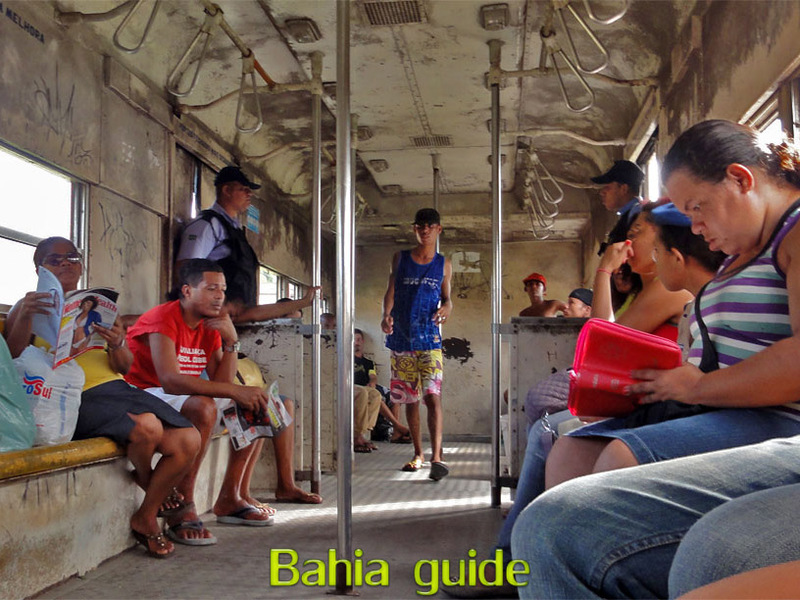 Ride on the favela-train Salvador presents many ways to undertake "social tourism" off the beaten tracks. 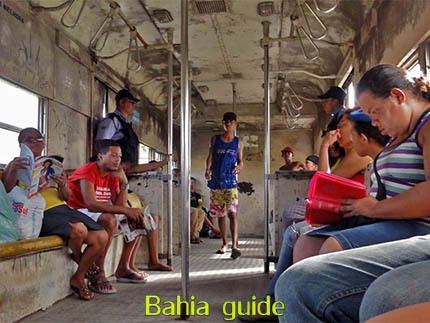 One of our favorites is a ride on the "favela-train" in the suburbs of Salvador. 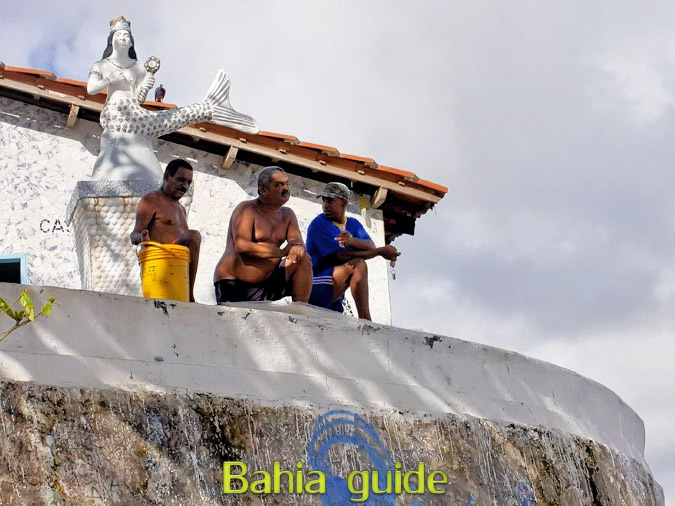 Friendship is so important in Bahia This incredibly corageous man may have no more legs but he appreciates our friendship, time and time again. 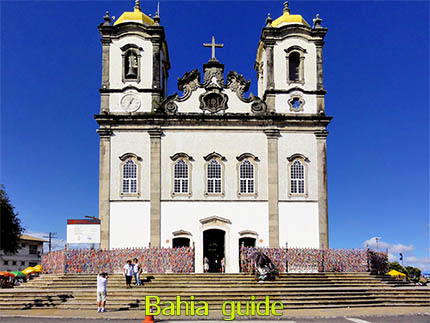 Bonfim Church One of the most enigmatic and important pelgrim-places in Brazil, the famous Bonfim Church, also known for it's syncretism between catholic and candomblé religion. 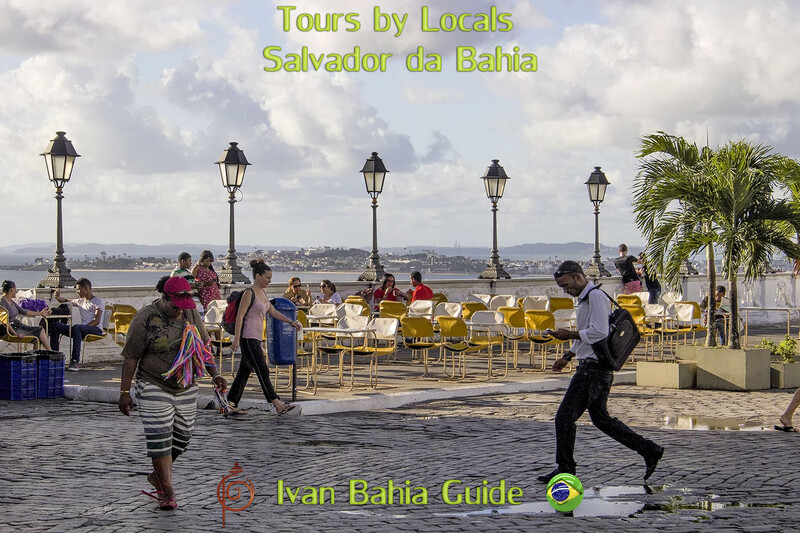 The most wanted, professionally licenced tour-guide service for every traveler in Salvador, Bahia, Cachoeira, Reconcavo Baiano, Nordeste, North East Brazil. 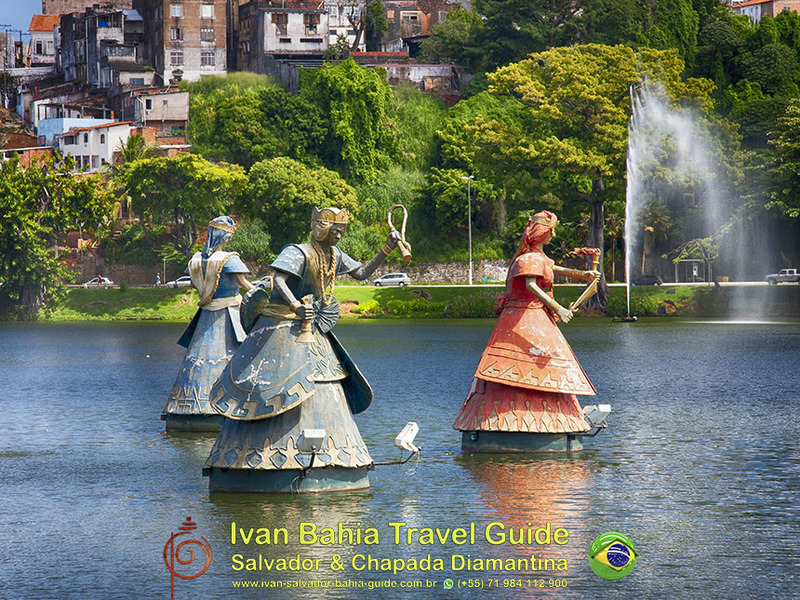 We apply the lowest price available for walking-tours by locals. Book now directly with Ivan Bahia Guide. We are happy to work together with Tours with Locals collegue Guides from Le Guide du Routard, Tripadvisor, Free Walking Tours, and Rent a Guide. 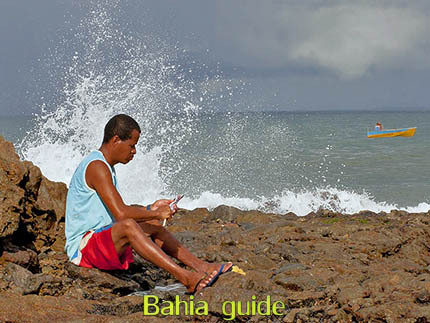 We thank Fernando Bingre, Marcio, Bahiaflaneur, Bahia Metisse, BahiaMetisse, Dirk Van Kerckhove, André Alves, Frank Faro, Sayuri Cardoso, Clara Manuela Bastos Ramos, Juha Paltila, Jürgen Szillat, Thiago Barra, Laura Medeot dos Santos and others for their collegiality.